The Treaty in 1774 that ended the war between the British and the Shawnee Indians ceded the territory south of the Ohio River to the Dominion of Virginia and the land north of the Ohio River to the Shawnees. In 1775, Daniel Boone began construction of his fort at Boonesborough, having presumption of right by Richard Henderson’s purchase of a large tract of land in Kentucky from several chiefs of the Cherokees. Needless to say, most of the Native Americans were not in agreement with these treaties and conditions. Most Native Indian tribes, Creeks, Choctaws, Cherokees, Shawnees and Chickasaws considered Kentucky to be their rightful hunting ground. During the French and Indian War, the French had established outposts and made agreements with the Indians offering goods and rewards for savagery committed against the colonial frontiersmen and the British. Now that that the American colonists were at war with the British, the British were taking the part of the French in stirring up the Indian tribes. The British found willing allies such as chief Black Fish of the Shawnees, who hoped to drive the Americans out of Kentucky and reclaim their hunting grounds. In the spring and summer of 1777 the Indians in the pay of the British had begun their attacks on frontier settlements. The British supplied the Indians with guns, gunpowder and lead and paid these savages for all the scalps they brought in. In January of 1778, with salt supplies running low at Boonesborough, Kentucky, which at the time was a county of Virginia. Daniel Boone and twenty-six men from the Fort had gone to Blue Licks to harvest salt from the saline springs. While there they were discovered by the Indians. Daniel Boone and the men from the Fort were captured and taken to the Shawnee village north of the Ohio River. Daniel Boone was adopted as the son of the Indian Chief Black Fish. He lived with he Indians for several months and learned that they were planning to attack Boonesborough with a large force of Indians led by British officers. Daniel Boone made his escape from the Indians to warn the settlers at Boonesborough of he planned attack. He had no provisions and only an rifle barrel and firing mechanism but without a wooden stock. In early 1779, George Michael Bedinger was in Shepherdstown with his mother and his siblings. His brother, Daniel though his health not fully recovered from ill treatment during incarceration by the British, re-enlisted and returned to service as a guard over the many Hessians that were held at Winchester. Brother Henry was still held prisoner by the British in Flatbush, New York. When the party neared Boonesborough they had a near encounter with the Indians that had been spying on the fort, but they arrived safely and found but fifteen men at the fort with Captain John Holder in command. Not more than two hours after their arrival a young man named Jacob Starnes burst into the fort with the terrible news that his father’s party of ten men who had left Boonesborough to return to Virginia had been attacked by Indians spying on the fort. The Indians had massacred all but the young man. Daniel Boone was absent. Boone had left the fort after the Indian siege the previous year to be with his family on the Yadkin in North Carolina where they had gone thinking he had been killed by the Indians. The distress of the Fort induced George Michael and other men of his party to join Captain John Holder’s Company. George Michael stayed in until abut November 1779. A part of the term he acted as an Indian scout. He went with small groups of hunters from the Fort, taking his turn with the other men to provide meat for the residents of the Fort. To this course he was induced by the feeling of humanity and sympathy for women and children who were unable to leave the country, and who, if they had attempted it, would have been massacred by the Indians, who were constantly scouring the country round the fort. The Fort would have in all probability been taken by the Indians had the group from Shepherdstown not joined in the defense of the fort when it did. George Michael considered his service at this place and time as the most dangerous, difficult, and at the same time the most useful to his country. Mainly by the success of the hunting excursions in which the hunters had to slip out at night, retire to some distance from the fort, kill game, which was generally buffalo, and pack it in some succeeding night. By these tactics the inhabitants of the Fort were provided with food. 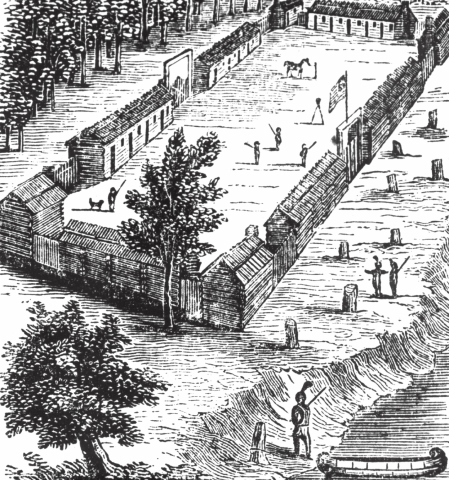 During George Michael’s service at Boonesborough, an expedition under Col. John Bowman of the Virginia Militia against the Shawnee Indian town of Chillicothe was planned and executed. George Michael acted as Adjutant and Quartermaster. Col. Bowman’s force proceeded to the Ohio River by way of the Licking River where they waited some time waiting for other troops to join them. They then went on to the town, with plans to station their forces on each side of the town, making an attempt to surprise and take the town. But the Indians were apprised of the approach of Bowman's force when a man stationed near the Indian houses, at night, fired his gun and killing an Indian. The Indians sought shelter in the council-house and sent runners to nearby Indian villages for reinforcements. Some of Bowman’s men sacked the Indian huts for silver ornaments and clothes and rounded up and the horses. George Michael had led a small group of 15 and was stationed behind a large oak log not over forty paces from the council-house. From this shelter they planned to charge the council-house when the others of Bowman’s force began their assault. Amid the chaos, Col. Bowman’s leadership of the men failed and the assault was not carried out. Later in the morning the Colonel crept up under shelter and at a safe distance to George Michael's party and shouted that he could not help them and for them to retreat as best they could. Being pinned down by the Indians who could fire from the council-house, George Michael had cautioned his men to stay down and not expose themselves. One who did raise his head to look at the council-house was shot dead. Bedinger told all his men to put their hats on sticks and raise them to draw fire and then all jump up and run for their lives, dodging and running in a zig-zag course until they reached cover. He counted “one, two, three!” and started running as he had told his men to do. Bullets whistled past him, but being agile and fast, he reached a tree and took shelter. Upon looking back, none of the men had followed immediately, but after all the Indians had fired at George Michael, they were able to escape before the Indians could reload. The men saw the reasonableness of this and responded. They formed a hollow square with the horses in the middle, Bowman at the lead and Bedinger at the rear and started an orderly retreat. They had made a retreat of some seven miles, when Bedinger realized the Indians were closing in upon them. He rushed ahead and ordered the men to form in a defensive position shielded by rocks and fallen trees. The Indians surrounded the men with the intent of keeping them in position until reinforcements arrived. Black Fish, the Shawnee chief, could be constantly heard urging his men to keep up the fight. Bowman stated he didn’t know what to do. Bedinger immediately decided a charge must be made, with tomahawk and rifle, directly at the part of the Indian line where Black Fish’s voice could be heard. Bedinger led a group of about 60 men who fought their way through the Indian line and managed to wound Black Fish. This demoralized the Indians and without their leader they left, carrying their leader with them. Black Fish died as they approached Chillicothe. Although initially blamed for not taking the Indian blockhouse and the eight or ten casualties suffered, the raid lead by Col. Bowman, with the destruction of the Shawnee village and the death of Chief Black Fish, is to be considered a victory for the Kentuckians. During the summer of 1779, George Michael and the two Swearingens, Benoni and Major Thomas, and Samuel Duree established land claims by making improvements on tracts of land they surveyed in the valley of Muddy Creek, near Boonesborough. Daniel Boone and his family returned to Boonesborough from North Carolina in the fall of 1779. George Michael remained at Boonesborough until November of 1779 when it is probable that George Michael's tenure at Boonesborough allowed him to meet Daniel Boone. Most of the other men in the Shepherdstown party returned to Virginia. Ralph Morgan and Capt. John Strode remained in Kentucky. Capt. Strode had come to Kentucky in 1776 when he marked and improved the land before returning to Virginia. When he led the Shepherdstown party to Kentucky he settled on the lands he had claimed on Strode's Creek, built a cabin and encouraged others to to settle around him. [iii] By the year 1781 the Strode's Station (now in Clark County) included twenty-five cabin homes. Capt. John Strode was the brother of James Strode the father of Rachel Strode who married Henry Bedinger(4). Ralph Morgan built Morgan’s Station, now in Montgomery Co. Ralph Morgan's father, Col. William Morgan was also the father of Col. Abraham Morgan who married Anna Maria Bedinger(8), the sister of George Michael Bedinger. George Michael's older sister, Elizabeth (6), married Abel Morgan, brother of Col. William Morgan. While in Kentucky Samuel Duree established a claim on Muddy Creek. He returned to Shepherdstown in the fall of 1779 and in the spring of 1780 led a group of families and single men, about 30 in all. [iv] Benoni Swearingen returned to Shepherdstown and married George Michael's sister Sarah Bedinger(10). Benoni lived in Maryland near Shepherdstown and represented his district in the Maryland Legislature. George Michael Bedinger returned to Shepherdstown in the fall of 1779. When he arrived in Shepherdstown, Henry Bedinger was there having been paroled by the British in the spring of 1779. It was usual for the British to parole American officers on the condition, sworn to by the parolee, that they not re-engage in the fight against the British for a specified period of time. The conditions of his parole was respected by Henry Bedinger as was commonly done by the American officers. George Michael Bedinger returned to Kentucky in late 1780 or early 1781 and was at Strode's Station when it was attacked by Indians March 1, 1781. [v] In the attack, two pioneers were killed, one wounded, and most of the livestock was destroyed by the Indians. George Michael returned to Virginia and joined Col. Darke's forces and and recruited a company for the regiment of Col. Darke in Berkeley County. In the month of May 1781, he took command of the Militia company under Col. William Darke and was engaged in military operations in Virginia where Gen. Cornwallis was active in skirmishing and attacking strategic resources of the patriots. George Michael’s company was active through the period leading up to and at the the siege of Yorktown. [i] Morgan, Robert, 2008, Boone a biography: Algonquin Books of Chapel Hill, 538 p., pp. 236-270. Dandridge, Danske, 1909, George Michael Bedinger, A Kentucky Pioneer: The Michie Company, Printers, Charlottesville, Virginia, 232 p., p. 43-65. Page modified April 8, 2015, June 10, 2015 and July 23, 2015.